I noticed this book in the footnotes of a number of books I was reading and decided to pick it up and read it. 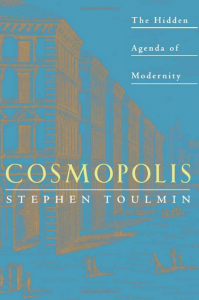 This is a classic discussion by an influential American university professor (Toulmin, 1922-2009) about the failures of modernism and a way forward. Toulmin’s development of modernism is captivating and easy to read. Toulmin explores Descartes’ quest for a stable foundation amid the religious, political, and scientific upheaval of his day. Toulmin’s explanation of Cartesian modernism is mostly helpful, but his suggestion to correct Descates’ quest by a quasi-return to Renaissance humanism is the serious issue. One further comment regarding the helpfulness of Toulmin’s book is that it is, surprisingly, an interesting and transparent illustration of the dangers of critiquing modernism from a postmodern, rather than Christian, perspective.